I used, too many years ago to count, to play in the Birmingham League which had a 40 move time control at which point, a player had the right to adjourn the game and seal a move. For those not familiar, this means that one player makes a move but instead of playing it on the board, it is written on an adjournment card, sealed in an envelope and given to a controller to keep. When the game is resumed, the envelope is opened and the sealed move played on the board. In this way, both players can study the game during the adjournment from the perspective of it being the other player’s turn to move so neither had the advantage. Modern computer chess engines have rendered this obsolete. On one occasion, my opponent was in a clearly lost position. The game was against Birmingham University in Selly Oak which is on the south side of the city. The team needed the point to secure a win so I dutifully drove down alone the next week to finish a game. My opponent wasn’t there at half past seven which entitled me to have the sealed move played and for me to make a reply and start his clock but I chose to wait out of courtesy. Eight O’clock came and went; still no sign. Eventually, on their suggestion, the sealed move was opened. It said simply “Resigns”. Partly as a result of this incident, a proposal was accepted that from the following year a player had the option in adjourned games, to send the position for adjudication to an officially appointed impartial arbitrator. In 1915, Ajeeb, a chess (pseudo-)automaton, was set up at Coney Island. A sore loser took out a gun and shot at the machine killing the operator hidden inside. In 1918, Aron Nimzowitsch lost a game in Berlin, and famously leapt onto the table bawling, “Why must I lose to this idiot!”. Equally famously, at Vienna in 1922, Alexander Alekhine resigned a game against Ernst Gruenfeld by throwing the king across the room. The following year, 1923, Alekhine smashed all the furniture in his hotel room after losing a game to Rudolf Spielmann. Who said you have to be a Rock Star? Players known for being sometimes violently bad losers prone to swiping the pieces off the board include Marlon Brando, GM Mikhail Chigorin, Benjamin Franklin, Karl Marx, Vladimir Lenin and Bill Gates. Not quite so aggressive, Anatoly Karpov is known to take losing very badly and for being clouded by a mood for several days following a loss. GM Eduard Gufeld notoriously verbally insulted players or decried their win while declining a handshake at the end of a game whever he lost. He once lost after Tony Miles as black had opened the game with 1.e4 c6 2.d4 Na6. The next day, Gufeld saw Miles at breakfast and loudly berated, “I hate you Miles. 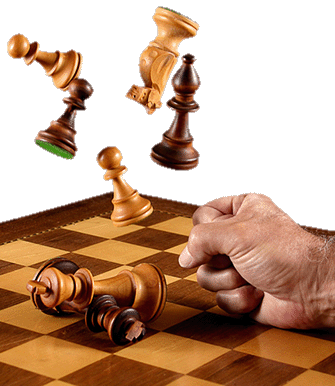 You are destroying chess with your stupid ideas”. The two never exchanged polite words again and it was taken as read that there would be no acknowledgements or handshakes at the board. At the Amsterdam tournament in 1950, Samuel Reshevsky and Miguel Najdorf got into a scuffle after a game and other players had to intervene to keep them apart. 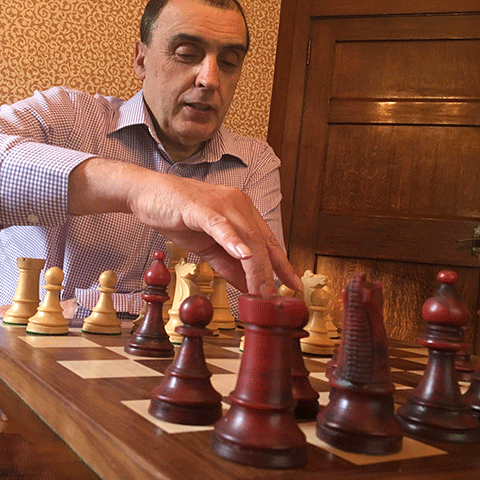 Bad losers are not confined to players; in 1971, when Tigran Petrosian lost his match with Bobby Fischer, Petrosian’s wife, Rona, walked up to his trainer, Alexey Suetin, and slapped him across the face. In 1974, the candidates match between Henrique Mecking and Tigran Petrosian was played in Augusta, Georgia. During the match, Mecking made a formal protest accusing the former World champion of kicking the table, shaking the chessboard, stirring the coffee too loudly, and rolling a coin on the table. Mecking went to the arbiter twice to complain that Petrosian was breathing deliberately loudly. Mecking kicked back at the table and made noises of his own but Petrosian responded by turning his hearing aid off. In 1977, when Korchnoi and Petrosian, both notoriously ill-mannered players, were due to play their Candidates match, a board had to be fitted between them under the table to stop them from kicking one another. So, all things considered, maybe I should have just counted my blessings and seen the funny side.